The Vibrating Wire Crackmeter consists of a telescoping sensor body incorporating a sprung tensioned Vibrating Wire element. Each end of the telescoping body is anchored either side of the crack to be monitored. A change in distance between the anchors, by the crack opening or closing, will cause the connecting rod to move within the transducer body, changing the tension on the spring and thus altering the resonant frequency of the wire. 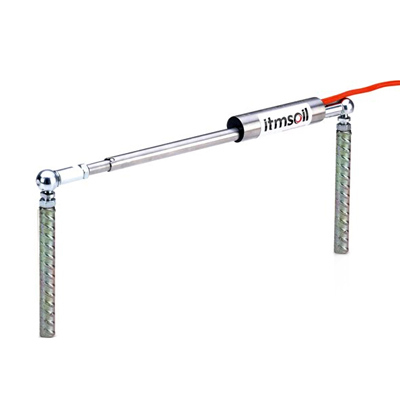 The itmsoil Vibrating Wire Crackmeter is designed to measure displacements across cracks and joints in buildings, bridges, dams, pipelines etc. It can measure in expansion and compression of joints. The sensor is made from high quality stainless steel, incorporates O-rings to allow for underwater use and is designed for long-term reliable monitoring. The sensor incorporates an over-voltage surge arrestor that protects against electrical damage. Fitted across a crack or joint, it monitors displacement by detecting a change in tension in the vibrating wire inside the sensor. W6-6.1 Nylon ties; 50mm x 3.5mm. Pack of 100No. ST1-3.5 Nylon ties; 370mm x 4.7mm. Pack of 100No.